The charming coastal resort of Acherounes ( Aherounes ) is located on the west coast of Skyros, and is just 10km south from the capital town of Chora. 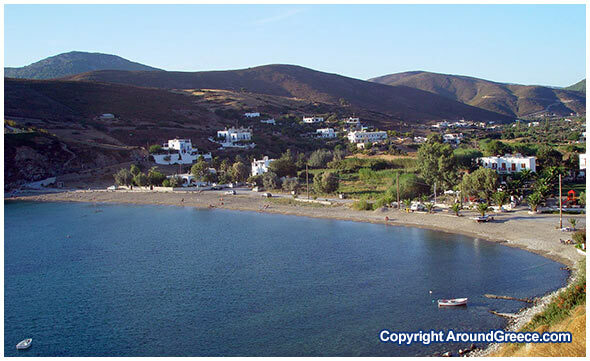 Acherounes is a very popular tourist resort that stretches along the coast and has a wonderful beach. The beach of Acherounes is one of the most popular on the island, and visitors from all Skyros come here during the summer months to enjoy the crystal blue waters and the soft golden sands. Due to it’s georgraphical location, the region is protected from strong winds, making it an ideal place for those who are travelling with family or young children. There are a couple of cafeteries and snack bars operating on the beach, where you can find drinks and light snacks. From the resort of Acherounes, one can pay a visit to the unique and highly picturesque chaep of Panagia Meglou. Every year on the 15th August, a large religious festival takes place here, to which everyone is invited to come and join in with the festivities and celebrations. Acherounes is an extremely naturally beautiful region of Skyros, and from here, you can enjoy some magnificent views stretching out towards the nearby islets of Skyropoula, Valax and Renae. A road that passes through Acherounes continues to the town of Linaria. Along the way, you will pass along a wonderful route of beautiful scenery and landscapes, as you head southwards.